Inter-tumor heterogeneity introduces significant challenges in designing effective drug development and treatment strategies. However, technologies that provide high accuracy such as the Biomedical Genomics Workbench overcome this challenge and aid researchers in understanding the causes, progression and recurrence of cancer. On this page we will demonstrate how the novel combination of remarkable accuracy and ready-to-use workflows in the Biomedical Genomics Workbench enable the detection of low-frequency variants and characterization of the mutation profile for every subclone in a tumor. The combination of high sensitivity with a low false positive rate enables the detection of low-frequency variants and the pursuit of the most promising disease-causing candidates. Figure 1 illustrates the results of testing on a dilution sample in which known variants are expected at the low level of 5%. The table demonstrates that the end-to-end cancer workflow in Biomedical Genomics Workbench (BxWB) achieves very high overall sensitivity with a very low false positive rate. Focusing only regions with sufficient coverage to detect low-frequency variants (> 200x coverage), the sensitivity is greater than 98% while the false positive rate is stable at a very low level of 0.000016. 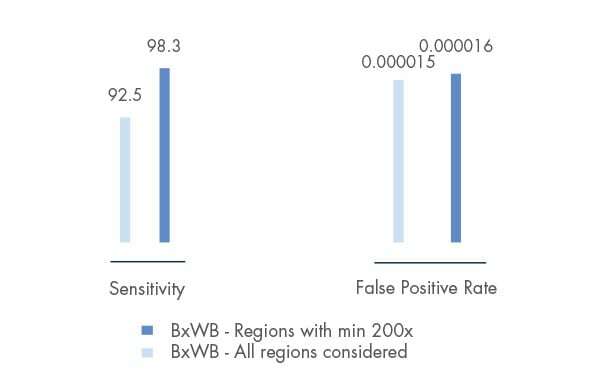 Figure 1: Sensitivity and false positive rate for the cancer variant calling pipeline in Biomedical Genomics Workbench considering all targeted regions in the sample versus using just regions with a coverage of minimum 200x. Our Copy Number Variation Detection tool works equally well on targeted amplicon sequencing data (PCR-based target-enrichment) as on whole exome sequencing data (hybridization-based enrichment). Tested on published targeted amplicon sequencing data1, Biomedical Genomics Workbench identified all causal copy number variants of different sizes (see figure 3 for details on the M62 line) with a very low overall false positive rate of 0.014 and a specificity of 98.42% on average. Likewise, the copy number detection tool achieves notably high sensitivity on theFoundation Medicine’s dataset, which includes tumor samples with different sample purity. We were able to demonstrate that across a range of sample purity from 40% to 100%, Biomedical Genomics Workbench was able to detect almost all of the copy number changes with only a slight drop in sensitivity at the 20% purity mark. 2. Frampton GM et al., Development and validation of a clinical cancer genomic profiling test based on massively parallel DNA sequencing. Nature Biotech. 2013, 31:1023-1031.